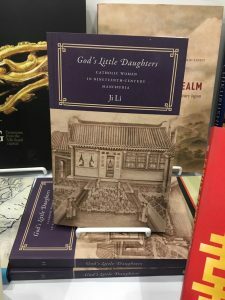 Li Ji’s book God’s Little Daughter’s has now been published in paperback by University of Washington Press. Congratulations Li Ji! For more information about the book, please see its page at the University of Washington Press website. 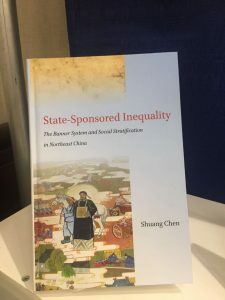 Shuang Chen’s book State-Sponsored Inequality: The Banner System and Social Stratification in Northeast China, published by Stanford University Press, was on display for the first time at the publisher’s stand at the 2017 Association for Asian Studies meeting in Toronto. To learn more about the book, please see the publisher’s website. Hao Dong and James Lee, along with their co-authors Satomi Kurosu, Matteo Manfredini, and Wenshan Yang, published their article “Kin and birth order effects on male child mortality: three East Asian populations, 1716–1945” in the March 2017 issue of Evolution and Human Biology. Using data from several historical East Asian populations, including Taiwan, the CMGPD-LN dataset for northeast China, and Japan, they examine how family context and birth order shape mortality chances in these specific populations and discuss the implications for our understanding of human behavior overall.